I thoroughly enjoyed this book It came to me as a surprise. For the past two years, my nephew has been urging me to read it when I kept passing it by. Finally, he put his foot down and told me a I was missing out on a great story and it turns out he was correct. The story starts in a hole deep in the ground, somewhere under London, where Dr. Burrows and his son will are digging for the unknown or the forgotten. A few days later, Dr. Burrows goes missing and Will sets out along with his friend Chester to find him. This search leads them to places they could never have imagined. This book made me want to burrow under a couple of quilt, sit in a dark room with a light shining over my shoulder just enough so I could read the words on the page. I could then imagine being in the same tunnels along with Will and Chester. When the vivid descriptions of the tunnels became oppressive, I had to go outside into the sunshine for a couple of breaths of fresh air. All the while Dr. Burrows and his son are digging around, his daughter, Will's younger sister, Rebecca is trying to keep the family functional. His mother is a wreck, rarely moving from in front of the television and seeming detached from her family. Through out the story, we get a good feel for Will and Rebecca. They are both strong characters, children who've had to grow up quickly. Chester is Will's voice of reason. He is a perfect sidekick, almost always willing to try something new, though he knows when to pull Will back. 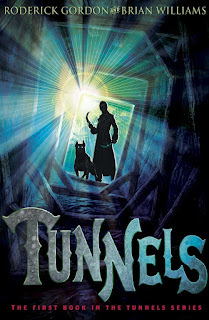 The tunnels came alive for me. I could imagine the dim lighting, the dust covering surface and the wonder of what they were seeing. At times I wanted to be with the boys and at others I was thankful to be in the sunshine. This book series should appeal to pre-teens and early teens. It would be a good choice for parents to read with their younger children. Cover image courtesy Chicken House Scholastic Books. It sounds like there is a great deal of wonderful description. Glad you enjoyed the book. Thanks for sharing. Stopping by from Carole's Books You Loved August Edition. I am in the list as #30 through #33.